News just in from bluewater that the 40.5m motor yacht taTii, currently on display at the Cannes Boat Show, has had a €2 million price reduction. 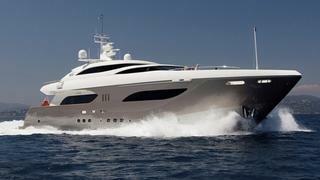 She was built by Tamsen Yachts in 2009, and has won several awards for her design. She is an "ex-demo" model and as such comes with a whole host of extra features, including a convertible sky-lounge with retractable sun-roof. Her interior is reminiscent of a boutique hotel, featuring exquisite design features characterised by zebrano and ebony woods offset by swathes of white on the leather-clad walls, sofas, armchairs and ball chairs in the saloon. Accommodation is for 12 guests in 5 staterooms, including a full beam master suite. She featured in the November 2010 issue of Boat International, an abridged version of which is available here on boatinternational.com. She is in excellent condition and has proven to be a very popular charter yacht. taTii is now asking €12.9 million, down from €14.9 million.